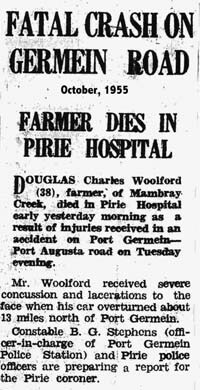 I have checked the Port Pirie "Recorder" years 1954 - 1962 on microfilm, for news stories about Port Germein. Where possible, I have scanned in photocopies of the stories, cleaned them up and displayed them, but sometimes the quality was too poor, in which case I have typed up the stories. 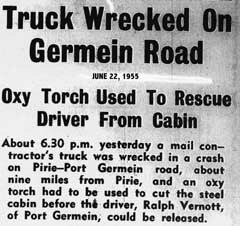 I include the news of the wrecking of the jetty on Monday, May 18, 1953 as it concerns many columns which follow. The jetty was not rebuilt until 1958. 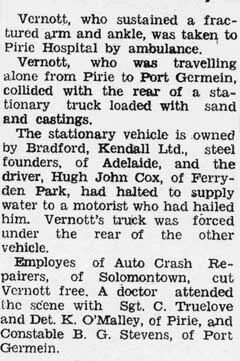 Electricity was connected to Port Germein in 1959. 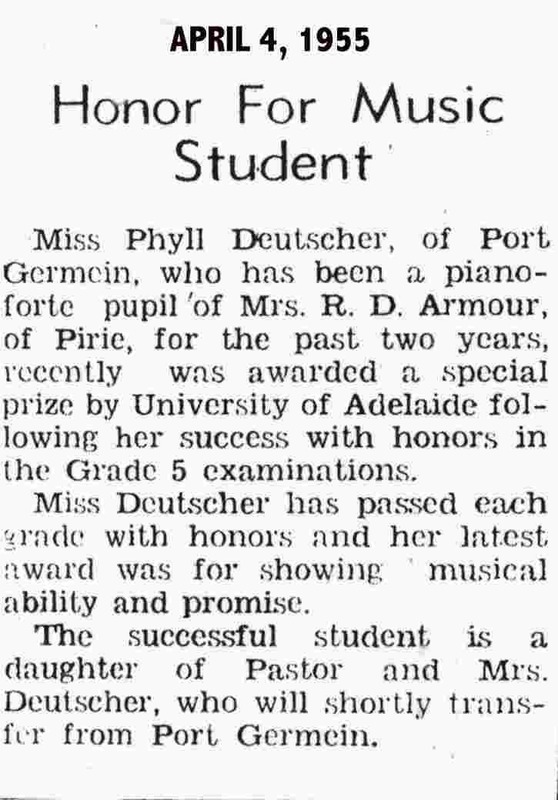 Despite a careful examination of "The Recorder" for the years 1954 to 1962 I have been unable to find one article about the palais, originally known as the Palais de Danse, on the foreshore of Port Germein. I am seeking photos and information on the palais with an aim to writing its history as it was a vibrant part of my childhood and sadly knocked down for scrap in 1964 without any apparent sign of protest or regret and, as far as I can find, not even a goodbye in the "Recorder." Port Germein residents are concerned at the possible removal of the well-known jetty, which suffered great damage in May last year, and are determined to fight for its retention and repair. Mr. E.K. Mitchell (postmaster) has convened a public meeting to be held at Port Germein tonight to discuss the matter. Mr E.H.D. Russell, M.H.R., and members of the Port Germein District Council have signified their intention to be present, and substantial support has been promised from Peterborough, Laura, Melrose, Murray Town and other surrounding towns. It is understood that the damaged jetty is to be dismantled and the material used in repairing the fisherman's wharf at Port Augusta. Thousands of tourists visit Port Germein each year, in addition to many hundreds who spend holidays at the popular resort, and it is feared that removal of the jetty will cause a cessation of sightseers. Mr. Mitchell said the future of the town depended on the famous jetty, which was the magnet for much trade being brought to Port Germein. "If the jetty is removed, the town will collapse. If the jetty is repaired, the town's future will be assured, " said the convener. One of the suggestions to be tabled tonight is that voluntary labour be sought for the necessary repairs, the work to be carried on under the supervision of Harbors Board officials, who control the destiny of the pier. STRONG DEPUTATION WILL APPEAL TO GOVERNMENT. One of the largest and most representative meetings ever held at Port Germein decided on Wednesday night to appeal to the Government through the Minister of Marine not to remove portion of the port's storm-damaged jetty to Port Augusta. 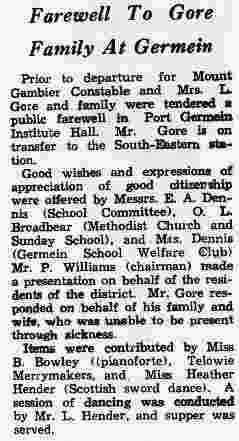 Unanimous opinion was that the contemplated action would condemn Germein to death as a tourist and fishing resort. Ways and means of repairing the structure were discussed, and an appeal will be made to South Australian Harbors Board for aid. The generally serious view taken of the Harbors Board proposal was illustrated by the attendance which crowded the large supper room at Germein Institute. Men were there from Pirie, Wirrabara, Melrose, Laura, Booleroo Centre, Stone Hut, the foothill's districts and as far afield as Peterborough. Mr. C.O. Geddes, who was voted to the chair, said that after the storm that caused the damage, the jetty had been offered to the district council, but that body had not been interested, and had not even discussed it. But the council realised what the structure meant to Germein and would certainly be sympathetic toward any move made. At the outset. apologies were tendered for the absence of Messrs E.H.D. Russell M.H.R. and C.L. Davis, M.P. Mr. E.K. Mitchell, who had convened the meeting said that the jetty was practically the life of Germein. Every year thousands of tourists used it, coming from far distances to enjoy the fishing and crabbing. Their presence meant trade to the town. "Take away our jetty and we shall have nothing left," said Mr. Mitchell. "It has the reputation of being the longest of its kind in the Southerm Hemisphere, and if it is removed, history is taken away. It is an insult to the town and fishermen of this port to take it away for the benefit of fishermen at Port Augusta." It has been stated that it cost £22.000 to build, and it has more than paid for itself in revenue to this state, catering for seagoing traffic. I feel that if the Harbors Board saves the jetty it will save the town." Mr. C.P. Prest: Has any approach to the board been made? Mr. J.H. Hillam: When Mr. E.C. Alford was chairman of the local beach committee he made overtures to the board but was unable to get anywhere. The board told him that the jetty was nothing more than a liability to it as it would not be needed for shipping. The chairman: the structure is deemed to be a danger to shipping. Another storm could cause timbers to be blown about in the gulf. Mr Mitchell: We have been told that the decking will be used in Port Augusta. The piles will be left standing. Will they not constitute a danger to shipping? Mr. Prest said that whatever was done to the jetty there would have to be a body responsible for it, either the Harbors Board or the local governing authority. The meeting should decide on what would be necessary to repair the structure, secure an estimate of the cost and then approach the Harbors Board with its proposition. The chairman: I do not think the district council would take charge of it. It was offered the structure to purchase for demolition or repair and declined it. Mr F. Munn suggested that a petition would strengthen the town's case. Thousands would sign for retention of the jetty. The chairman said that Mr. W.W.Robinson M.L.C. had promised to do all possible to facilitate a deputation meeting the Minister of Marine. A petition might not be necessary. Mr. Mitchell: The Mayor of Pirie, as a member of State Parliament, has promised to stand in with us in our effort. Another speaker said that that the Government was spending thousands of pounds in restoring storm damaged promenades round the city so that people could walk along and "look at the water." It surely could find some money to retain a jetty which meant so much to a port and which had industrial value. Mr. Mitchell said the beach committee had incurred heavy expenses on improvements to the area. Country Women's Association had acted similarly in establishing a holiday cottage. All that money would be wasted if the Harbors Board carried out its intention. Mr. Prest said that Port Pirie's efforts to have wharf work done had shown that the board was apparently short of cash. It was a hard-headed business concern, and the first question it would ask a deputation would be the estimated cost of repair. Mr Hillam: It has been stated that it would cost £30,000. Who would we get to give us an estimate apart from the Harbors Board itself? Mr. L. Hender said the meeting should first decide what it wanted and then seek someone reliable to give an approximate cost. Mr. C.R. Crittenden regretted that Germein had not battled harder to secure some of the money allocated by the Government for storm-damaged water fronts. He felt that the district council would carry more authority than a citizens' committee and would obtain a better hearing from the Minister. Mr. Hender: Has the Tourist Bureau been approached? It might be able to help us. The chairman: Nothing has been done yet. Mr. C. Broadbear said that voluntary labor had been suggested to tackle the repair job, but he felt that idea could be "wiped off." Port Germein today meant nothing in a shipping sense, but with the steady expansion of Port Pirie it might transpire that shipping would be glad to fall back on the smaller port. Accommodation in Pirie could not be extended, and the harbor authorities would not look toward Port Davis and Port Broughton. "With a T-piece at the end of our jetty, it could take the largest vessel afloat," he said. After long discussion, Mr. Prest moved "That this meeting favors retention of the jetty and that an appeal be made to the Harbors Board to have it repaired." The motion, seconded by Mr. C. H. Bowley, was adopted unanimously. 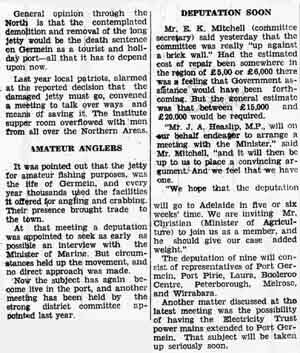 Mr Mitchell told the meeting that 95 per cent of the material was still in Germein. With it available much expense would be saved. Mr. Hender: About 1,500 sleepers were brought ashore and stacked. A suggestion was made that the stone end of the structure should be constructed with stone out as far as possible, thus cutting down the amount of timber needed. Mr. Bowley said there were many good decking planks that could be cut down to re-cover the damaged portion. One point was that the Harbors Board would have to spend money to retain the light at the extreme end. Further debate on whether an attempt should be made to repair the jetty as a whole or in part was concluded by a motions by Messrs Mitchell and Crittenden that the entire length be the objective. Another suggestion was that a deputation representative of as wide an interested area as possible should be appointed to approach the Harbors Board with the assistance of Mr. W.W. Robinson, M.L.C. Mr. Hillam moved that a deputation of seven should be appointed on a basis of two members from Germein and one each from Port Pirie, Laura, Wirrabara, Melrose and Peterborough. The motion was adopted. Melrose: Mr. C. O. Geddes. Port Germein: Two to be chosen. It was resolved to invite Mr. J. A. Heaslip, M. P. to join the deputation, which would visit Adelaide as soon as material for a good case had been collected. The following committee of eight local representatives was chosen to assemble facts and evidence in connection with the appeal to the Minister of Marine at an early date:- Messrs N.S. Holman (chairman), J.H. Hillam, E.K. Mitchell, M. Ryan, W.E. McKenzie, E. Dennis, W.H. Little and C. P. Prest. A revival of the combied (sic) Northern effort to save Port Germein as a holiday and pleasure resort wil be made in the near future, when a strong deputation will go to the Minister of Marine in search of Government financial aid. It is estimated that between £15,000 and £20,000 will be required to restore to safety the storm-damaged jetty. Note that the meeting also discussed the possibility of having power extended to Port Germein. Port Germein Methodist Church was beautifully decorated with dahlias and zinnias in pastel shades for the marriage of Dorothy, elder daughter of Mr and Mrs Owen Broadbear, to Pastor Milton J. Hender, elder son of Mr and Mrs Lionel Hender, of School House, Port Germein. Pastor Deutscher, of Port Germein, officiated and Mr Lionel Hender was organist. During the ceremony, Mrs F. Prettejohn, of Adelaide, sang "Because." Dorothy's frock was of white satin with a tulle yoke on a fitting bodice, the yoke being edged with a double tulle frill. The very full skirt had an apron front made with a double tulle frill which extended round the edge of the train. Long pointed sleeves were buttoned at the wrist. The tulle veil was gathered at each side of a coronet of orange blossom. Bridesmaid Miss Nancy Hillam and miniature bridesmaids Heather Hender and Irene Broadbear, were frocked in embossed satin of pink and blue respectively. They wore fitting bodices with large double Bertha collar round the shoulders and full, gored skirts finished with a large flower at the waist line. The bride's bouquet was of white gladioli and roses, while the bridesmaid held a sheaf of pink and blue gladioli. Each bouquet contained a sprig of white heather sent specially for the occasion from Dingwall, in the Highlands of Scotland. The miniature bridesmaids carried muffs of matching material trimmed with a bunch of pink rosebuds, with trailing ribbons, and each wore a gold locket and chain, the gift of the bridegroom. The groom's younger brother, Constable Douglas Hender, of Mt Gambier, was best man. The bride's mother was present in a dusky pink beaded crepe frock with navy hat and accessories. The bridegroom's mother wore grey with black accessories. Each wore a shoulder spray. 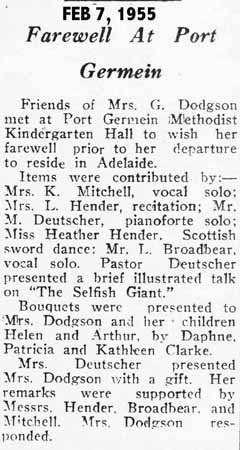 Guests were entertained at a reception in the Port Germein Hall, and Pastor Deutscher was toastmaster. 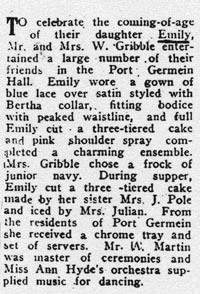 A two-tiered wedding cake, made by Mrs A. E. Blieschke and iced by Mrs S. Julian, was cut by the happy couple. Pastor and Mrs Hender will move to Streaky Bay after a honeymoon in Adelaide and Lucindale. Pastor Hender will take charge of the Streaky Bay Methodist Church. Mesdames C. R. Crittenden (president) and G. Henderson (secretary) made an effective contribution to the International Day observances by wearing a Papuan grass skirt and lap-lap respectively. Eighteen members attended the meeting, and apologies were received from Mesdames W. Mudge and P. Pillion. Mrs. Henderson read an interesting paper on the customs and dress of Papuan people. Two minutes' silence was observed in memory of Mrs. E, C. Afford, a former president and foundation member, who passed away at Gawler recently. The treasurer reported a balance of 32 pounds 15/7. A donation of 2 pounds 2/ to the Flying Doctor Service Appeal was recorded. A copy of "So We Grow," the record of 21 years' service in South Australia by the C.W.A., will be sent to the Englsih link branch at Bisley. The president read a letter from Mrs. Christine Ellen (link correspondent). Funds from a trading table completed the purchase price of a garden hose for the holiday cottage. Subscribers' Record at Germein Institute Reports presented at the annual meeting of members of Port Germein Institute indicated a healthy position in the institution's affairs. Much had been done during the year in the way of improvement to the grounds, and a large contract for painting and renovation had been let. Those works were not yet complete. It was reported that the committee had in mind arrangements for a large social function when the renovations were complete to be followed by an auction sale to help funds. Last year's effort in that direction had raised 250 pounds. At present, stated the secretarial report, there were 37 adult subscribers and 3 juvenile-the greatest number for many years. Officers appointed were:- Messrs. O. L. Broadbear, president; F. McDougall and W. Gribble, vice presidents; Miss F. B. Bowley, secretary; Mr. L. Hender, treasurer; Messrs. A. Blieschke and A. Miller, auditors: L. Pole, T. Hobart, J. Turner, L. Mudge, J. Hillam, E. Atkinson, P. Williams; Mesdames C. Bowley, A. Hutchison and E. Deutscher, committee. A busy and successful year's work was reported upon at the annual meeting of Port Germein School Welfare Club. During the period, it was stated, the club had been instrumental in purchasing a piano for school use, and that, with provision of pictures, library books, and gifts was a fair indication of the zeal of members. The club was also subscribing to "National Geographic Magazine" for use by the scholars. 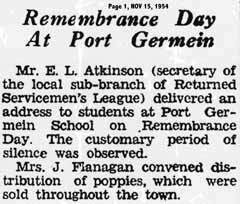 It had arranged for parties for the infant division at Easter and for the whole school at Christmas. Newly-elected office-bearers are as follows:- Mrs. E. A. Dennis, president (re-elected for the fifth term); Mrs. L. Darby, vice-president; Mrs. W. McKenzie, secretary and treasurer (re-elected for fourth term), Mesdames J. Pole, L. Olsen, C. Woolford, and H. Bessen, committee. Mesdames T. Hobart, K. Williams, and E. Barton were welcomed as new members. Mr. Lionel Hender (head teacher) congratulated the ladies on the success that had followed their efforts and thanked them for their untiring work for his school. Workmen from the Architect-in -Chief's Department have completed the construction of a 20x25 portable room at Port Germein . A small room, vacated by classes which will occupy the new room, will be used to house a school library and serve as a reading room. With the growing school population, library needs have increased, and Mr. L. Hender (head teacher) and the Port Germein School Committee are grateful to the Education Department through its officers, Mr. E. Butcher (inspector of school for the far north district) and Mrs. D. Riddle (former supervisor of school libraries) for the co-operation received with that aspect of school life. Record congregations were present for the seventy-fourth anniversary of Port Germein Methodist Sunday School. Trained by Mr. L. Hender(organist) with assistance from Mesdames M. Darby and L. Hender, the children were in good form and their contribution to the service was well received. Rev. C. Christopher, of Risdon Park Methodist Church, conducted the afternoon service, and Pastor I. Goss, of Port Germein, the evening service. Songs by the kindergarten, led by Miss Irene Broadbear, were appreciated, while the juniors presented a bright number, set to an old German air by Elizabeth Wiltshire. Adam Geibal's beautiful harmony was used as the setting for a part song :We Wonder Why." Soloists Graham Pole and Beverley Bessen were heard in "God Made Little Robin." Scripture passages were recited by Misses Rose Eaton and Patricia Burge. A fellowship tea was held between services and a session of community singing was conducted by Mr. and Mrs. Hender before evening service. 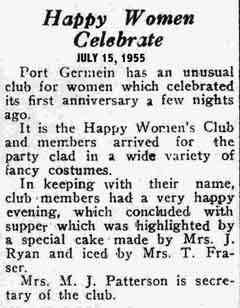 An encouraging increase in attendance was noted at the monthly meeting of Port Germein branch of Country Women's Association, which was chaired by Mrs. C. R. Dahlenburg, jun. Three new members were among those present. Due to members' keen interest in the forthcoming Dolling Group table day at Gladstone, Port Germein decided to enter a table. Mrs. Dahlenburg had the pleasing duty of presenting Mrs. Marie Bresolin with a souvenir sugarspoon to commeroate her recent naturalisation. During the afternoon Mrs. Flanagan handed to the branch a photo and the lifemembership badge of her mother, the late Mrs. Ethel Alford. A resolution was passed at the Dolling Group conference that the photo and the badge were to be hung in Port Germein restroom. A trading table realised ��3. Biscuits will be brought by members to the August meeting for use at the C.W.A. kiosk at the showgrounds at the Royal Adelaide Show. The annual picnic of Port Germein School was held at Weeroona when transport provided by the school committeee was heavily taxed by the large number of parents who took the opportunity of spending the day out with their children. A sports committee comprising Messrs. J. Walsh, L. Olsen, H. Bessen and helpers provided a keenly contested programme for Seniors while Mrs. L. Hender and Miss B. Bowley arranged a programme for the junior group. Mr. E. A. Dennis (president) and Mr. T. Hobart (secretary) expressed appreciation for the efforts of all concerned with the enjoyable outing. Sweets, fruit and cordials were provided for all children present. 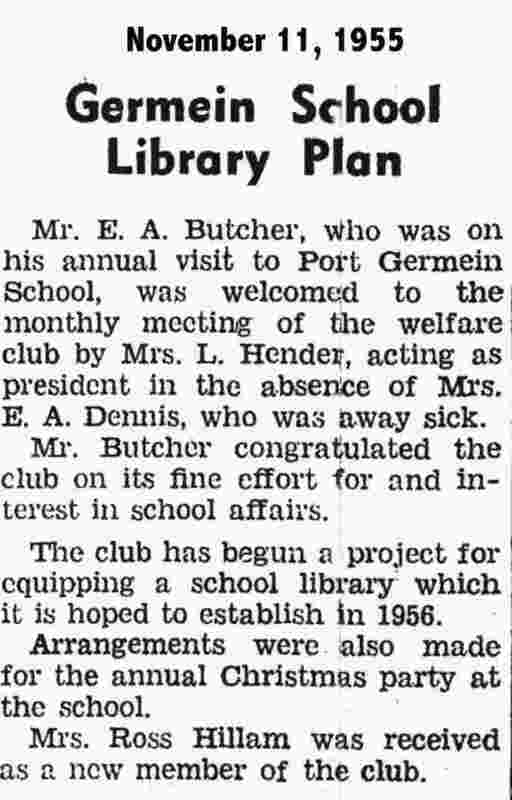 Mr. E. K. Butcher, who was on his annual visit to Port Germein School, was welcomed to the monthly meeting of the welfare club by Mrs. R. L. Hender, acting as president in the absence of Mrs. E. A. Dennis, who was away sick. Mr. Butcher congratulated the club on its fine efforts for and interest in school affairs. The club has begun a project for equipping a school library which it is hoped to establish in 1956. Arrangements were also made for the annual Christmas party at the school. Mrs. Ross Hillam was received as a new member of the club. Scholars and teachers at Port Germein Methodist Sunday School staged a bonfire and fireworks display to celebrate Guy Fawkesw Day. An energetic committee of ladies, led by Mesdames J. Pole, L. Hender, H. Besses, E. Barton, W. Darby, O. Woolford, A. Hutchinson, F. Havers, and O. Broadbear, were responsible for a fine evening's entertainment and supper. Despite showers of rain, which dampened the enthusiasm of the gathering, the sum of ��8 was raised for Sunday school funds by the effort.